Polished 18kt Everose gold fluted bezel ring. Brushed outer links & polished center links. Fitted with the patented Easylink 5mm extension link. 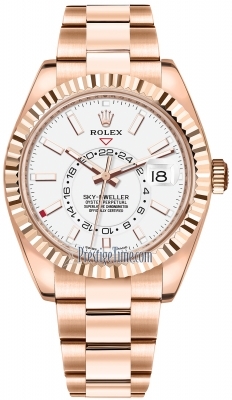 "Sundust" colored dial which is a beige/pink color. Fine printed minute/seconds track on the dial rim. Hour & minute hands with luminous filled tops. Off-center silvered 24 hour ring. Inverted red triangle indicating the additional time-zone. Indicated in 24 hour mode to enable its wearer to easily distinguish between AM & PM at the additional time-zone location. The date can be adjusted both forward & backward. Date window displayed at the 3 o'clock position with a "cyclops" magnifier. Month display via small apertures (windows) at each hour marker (12 hours/12 month). A deep red filled display window indicates the current month. A manual correction is required only once a year on March 1st to compensate for the shorter 28 or 29 days of February. 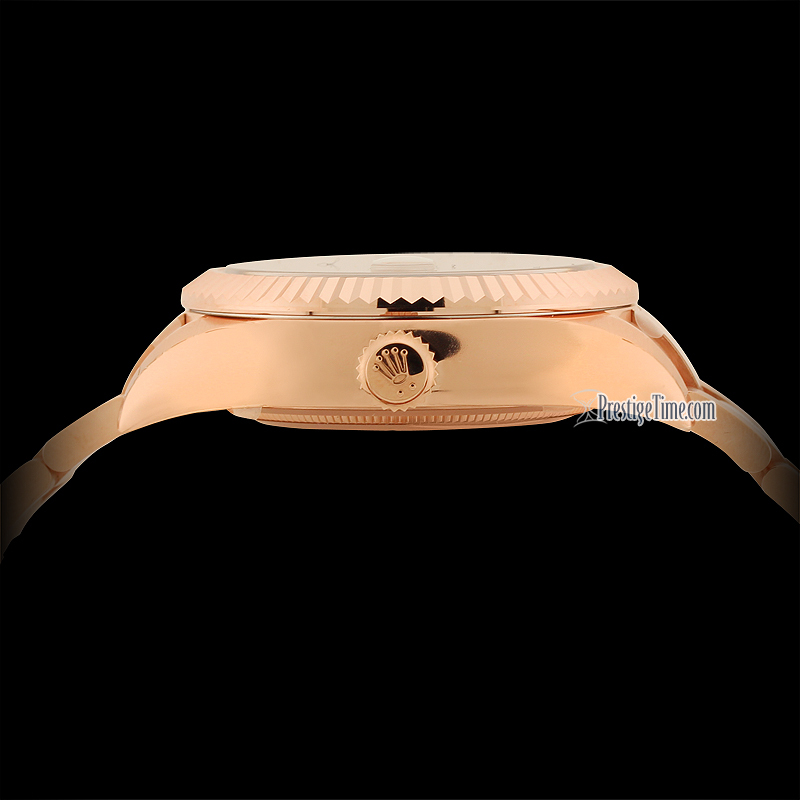 Adjust in 1 hour increments, without stopping the watch allowing the dual time-zone to adjusted without interrupting the watch operation of the movement. 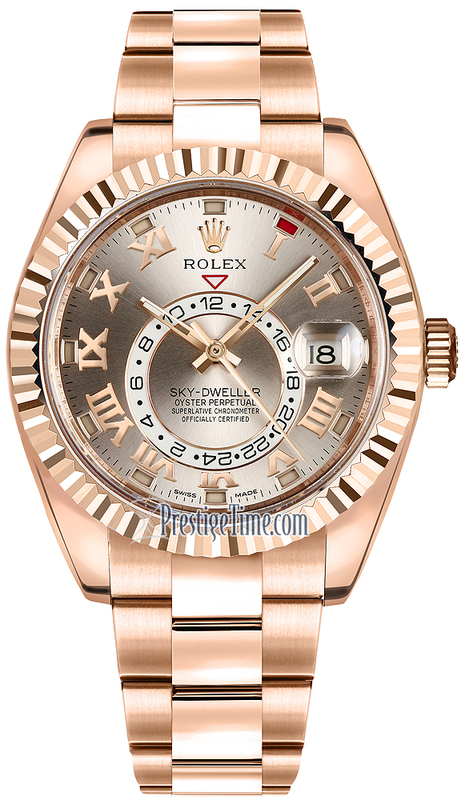 The bezel is key to setting the 3 functions of the watch (time, dual-time & annual calendar). The "RING COMMAND BEZEL" features 3 positions with each position corresponding to a different function of the watch. Simply rotating the bezel to the position of the corresponding watch function will the correction of that particular function via the crown. 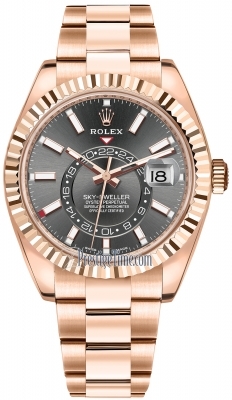 Rolex in-house calibre 9001, beats at 28,800 vph, contains 40 Jewels & has an approximate power reserve of 72. High performance Paraflex shock absorbers. 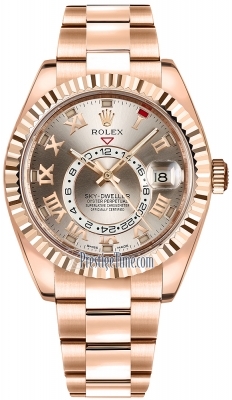 The watch boasts a total of 14 patents, seven of which are on the movement.